The first systematic breakthrough innovation technique was introduced to the world in the 1970s, but it was not until the 1990s that the body of knowledge began to take off. Last year, 2015, marked what numerous people have called the twentieth anniversary of disruptive innovation - introduced to the world by Clayton Christensen in 1995. During the past two decades, many companies and makers have targeted the creation of new-to-the-world products. These efforts have resulted in a number of systematic approaches that are all disruptive in their own way. GGI performed secondary research and identified nine techniques that have emerged in the past twenty years. Our scan covered a number of notable periodicals including: Harvard's Harvard Business Review, The Economist's Chief Financial Officer, MIT's Sloan Management Review, IRI's Research & Technology Management, IEEE's Engineering Management Review, IEEE's Transactions on Engineering Management, ASEM's Engineering Management Journal, PDMA's Journal of Product Innovation Management, PWC's [formerly Booz's] Strategy+Business, and other publications. Breakthrough Innovation: Nine Techniques [Machine Design - May 2016] gives a one paragraph description of each technique and provides active links to selected sources and writings for the reader to explore. Please note that since the May issue was published, we have added "Lead User Analysis" to the list of breakthrough techniques. Lead User Analysis preceded Clayton Christensen's writings by fifteen years, but it is nevertheless a breakthrough innovation technique. In this article, published in the July 2016 issue of Machine Design, GGI researchers went a bit deeper to explore the impact(s) of these breakthrough innovation techniques on the time tested practice of "design for manufacturing and assembly [DFMA]." DFMA has been integral to the effective launch of most industrial and consumer products for the past five decades. 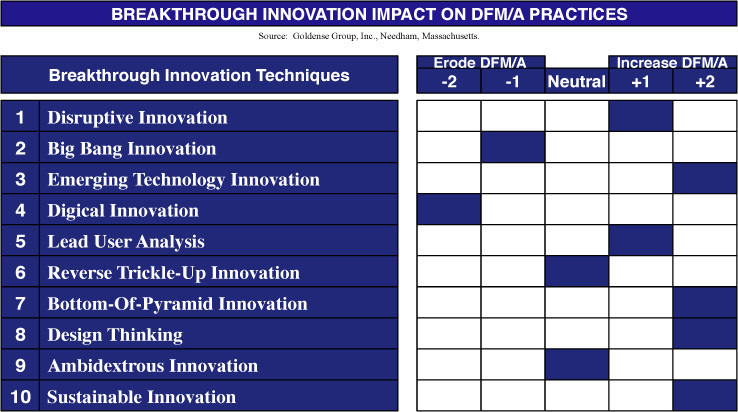 Our goal was to learn which breakthrough techniques might increase the importance of DFMA practices during development versus those with a neutral or lessening effect on this important body of knowledge. This article is probably not a high priority read for most folks. But if you are involved with the design and development of "new-to-X" products, and/or the transition of these products into manufacturing and then the marketplace, there is likely something of value to be derived from taking a few minutes to consider these analyses. Impact of Breakthrough Innovations on Design for Manufacturing and Assembly [Machine Design - July 2016] examines the differing effects that radical, disruptive, and breakthrough product initiatives may have on DFMA over time.